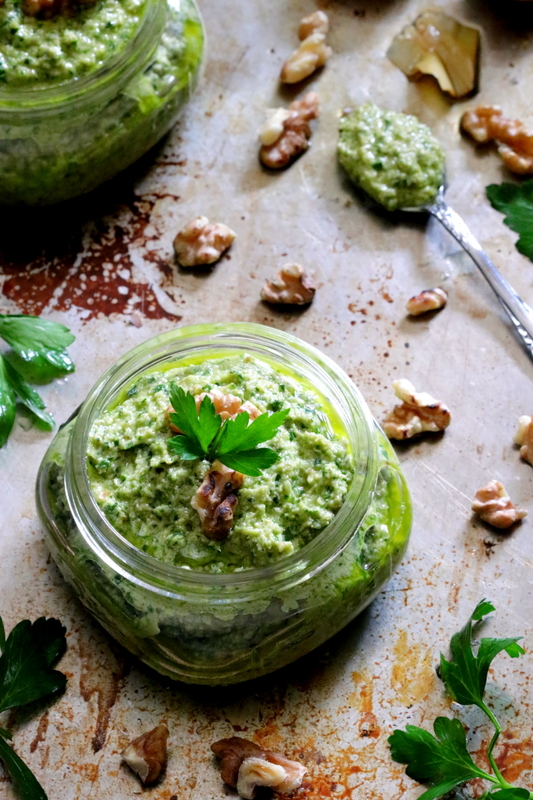 A delightfully Easy Homemade Artichoke Pesto sauce made with oil and vinegar preserved artichokes, walnuts and parsley. Bursting with unmistakable fresh flavors, this irresistible pesto sauce comes together in mere minutes. Nowadays its quite easy to find a variety of pesto sauces in your local grocery stores. But for once, I urge you to skip the store bought variety and try a homemade version from your own kitchen. Once you do…you never go back! For one the flavors are far more superior but mostly its really just so, so easy to make your own. A food processor speeds up the process but also a hand held emulsion blender would work equally well here. Also a homemade pesto can be customized to your own personal tastes. The walnuts can be substituted with almonds or other favorite nuts. And if you follow a vegan diet, you can simply omit the Parmesan cheese. 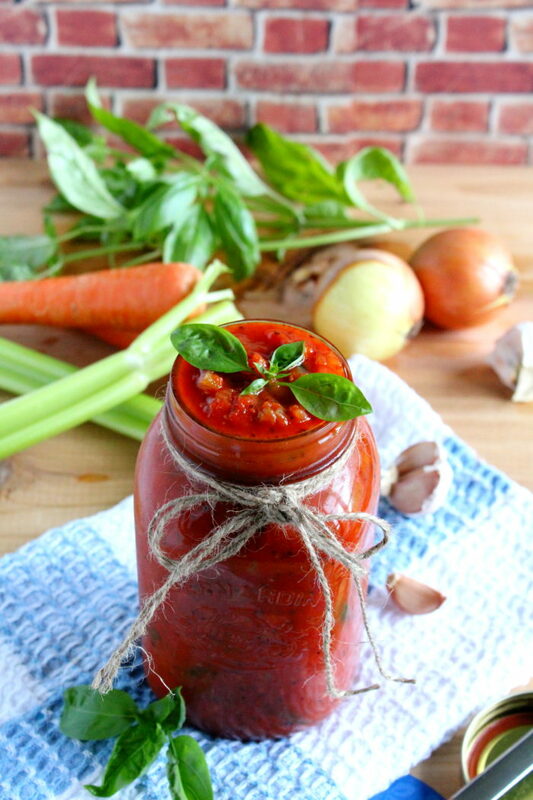 This would still give you quite a flavorful and tasty sauce with all the nutritional benefits. 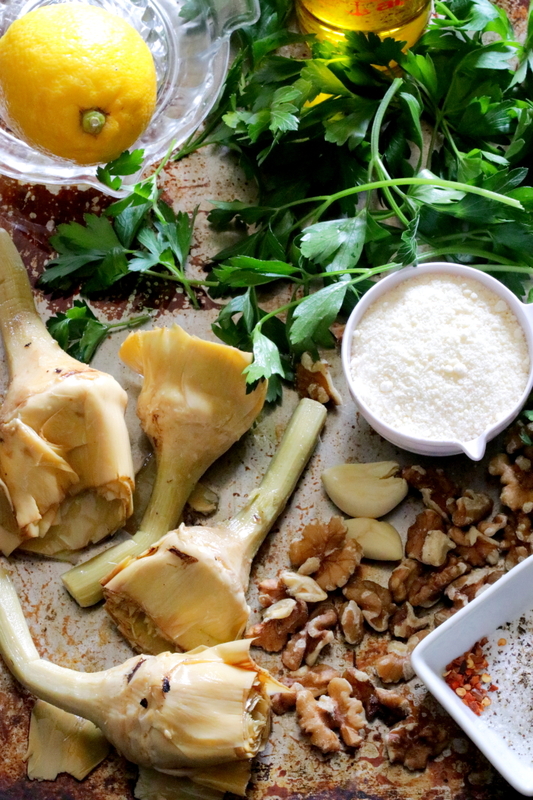 Artichokes are one of the more staple vegetables I grew up with and just adore. But I admit that they’re quite a chore to clean and requires lots of hands on experience to trim. To simplify this pesto sauce I opted for oil and vinegar packed artichokes with the stems attached that are sold in glass jars. I drained them well and patted them down with paper towels because I really wanted the taste of my extra virgin olive oil to come through. However, you can use frozen artichokes but just remember to thaw them first! 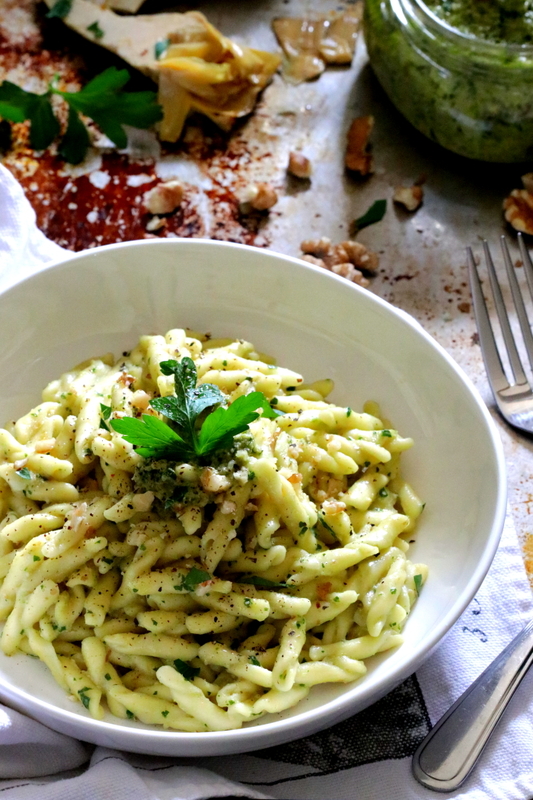 There are many ways you can enjoy this Easy Homemade Artichoke Pesto. 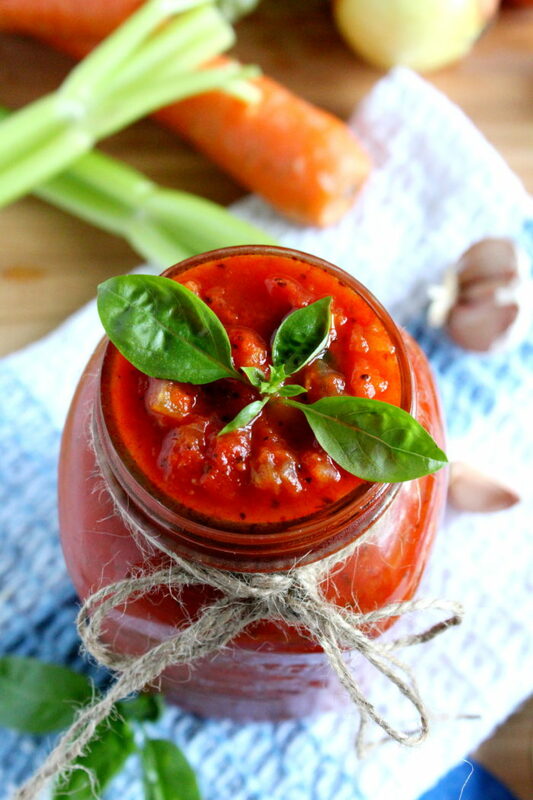 Use as a condiment in your favorite sandwiches or top over crostini as a quick appetizer. Its also equally delicious accompanied alongside poultry or fish and makes an amazing quick sauce to toss with your favorite pasta. 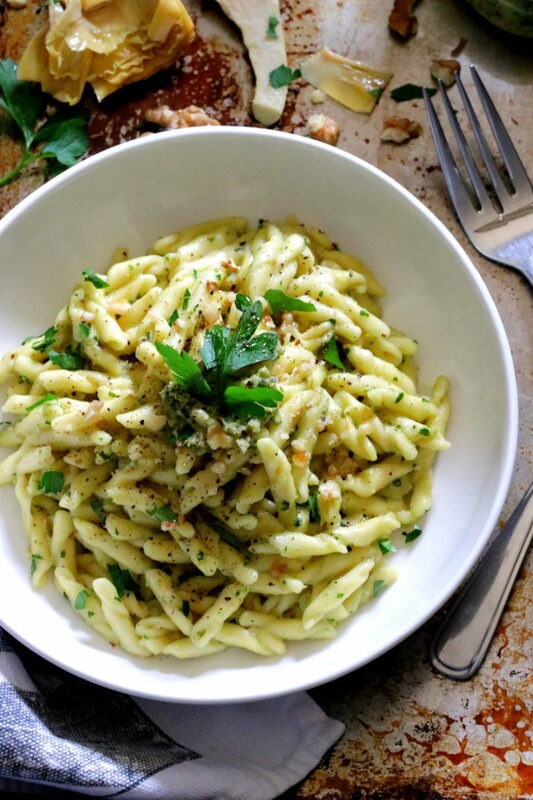 Speaking of pasta, I would definitely say that these Trucchetti noodles with the elongated and twisted shapes make a perfect pairing with the creamy pesto sauce. The twisted form creates little crevices which traps and cradles the artichoke pesto and delivers lots of yummy goodness in every bite. First off, when tossing the pasta with the pesto use some of the cooked pasta water to thin the sauce. Use only as much as needed because this will ensure even distribution throughout the pasta dish. As a result you’ll be enjoying a wonderfully delicious pasta meal with a delightful creamy and flavorful sauce! 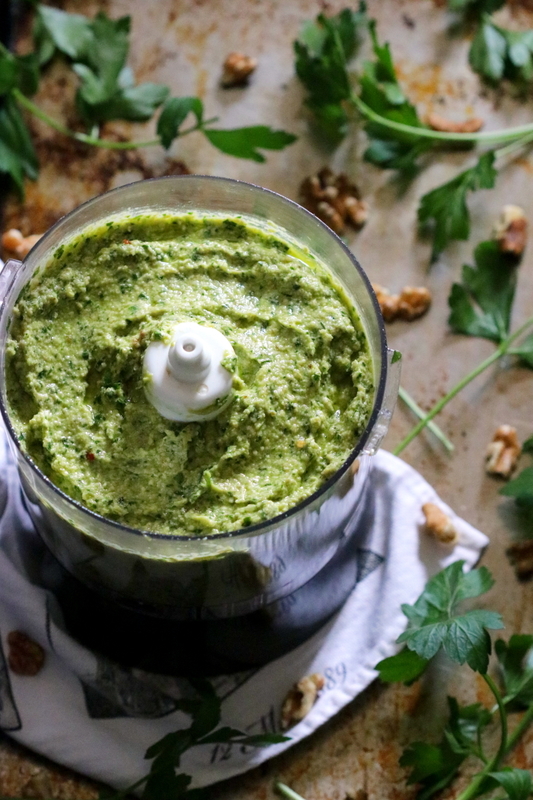 A delightfully Easy Homemade Artichoke Pesto sauce made with walnuts and parsley, bursting with fresh flavors and ready in mere minutes. In a food processor add the first 7 ingredients and with the motor running pour in the extra virgin olive oil and pulse just until you get a smooth paste. Stir in the salt and pepper to your taste. You can use artichoke pesto as a condiment in sandwiches, tossed with your favorite pasta or simply to enhance the flavors in a particular dish. STORE PESTO in the fridge for up to 1 week with a layer of oil over the top to keep the greens from oxidizing or freeze for longer shelf life.